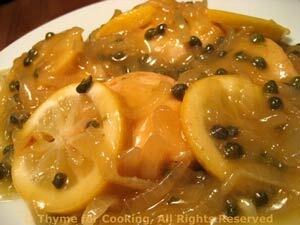 Lemon Caper Chicken Breasts, Thyme for Cooking healthy gourmet main course. Slice lemon, discarding ends, and remove pips. Heat oil in nonstick skillet. Add onion and sauté until tender, 7 - 8 minutes. Move onion to sides of pan and add chicken breasts. Sauté until light brown, about 5 minutes per side. Add chicken stock and capers. Arrange lemon slices on top of chicken breasts. If you have too many slices just put directly in the stock. Cover, reduce heat and let simmer about 10 minutes, until chicken is done. Remove chicken and lemon slices to a plate and cover with the lid from the pan. Turn heat up and when stock is boiling add cornstarch mixture, stirring until thickened. Serve chicken with lemon-caper sauce on the side.